California Closets of Nashville designer Kylee Clement shows Kristie Barnett with The Decorologist and Elizabeth Scruggs with Superior Construction the showroom and many custom options they offer in organizational home solutions and design. Happy weekend! I love looking at beautiful homes and getting decorating ideas. I hosted a group of local bloggers earlier this week for a fun tour of the 2017 Nashville Parade of Homes in at Witherspoon Brentwood community. 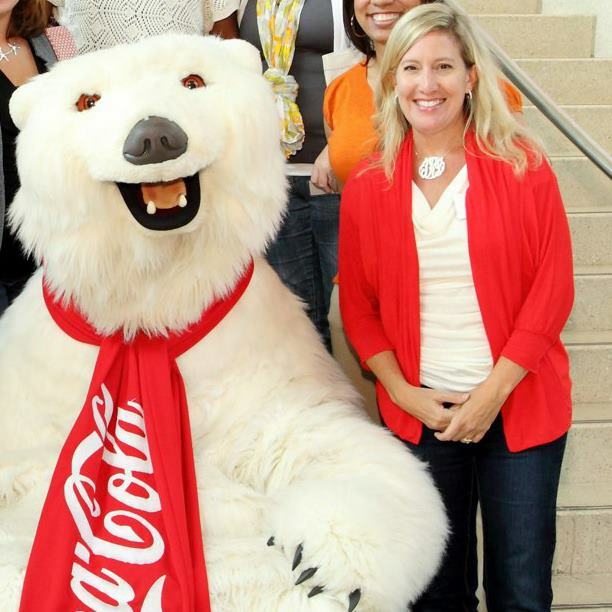 Our tour guide was Kylee Clement with California Closets of Nashville, which is a locally owned franchise. 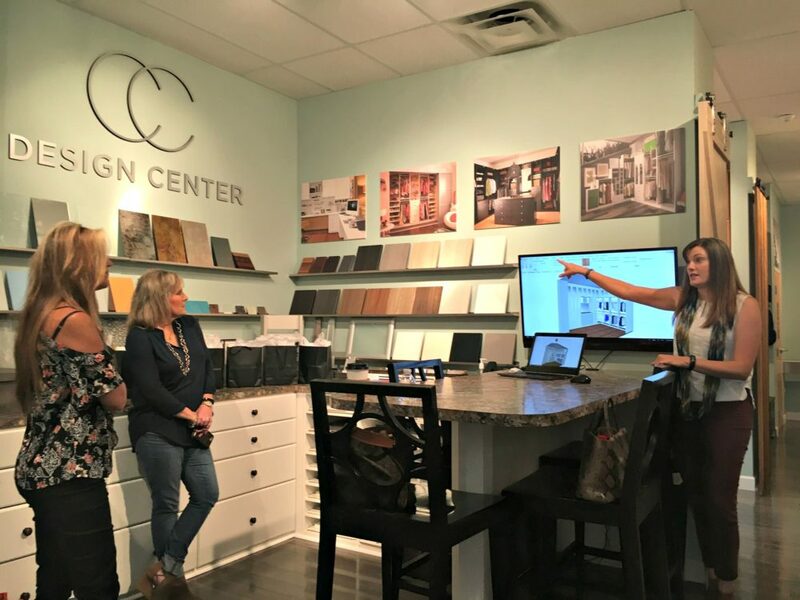 We had a quick meet up at their showroom in Cool Springs where Kylee showed us around and gave us an overview of all of their design projects, which go way beyond closets! California Closets of Nashville designs pantries, home offices, garages, media centers and even Murphy bed wall systems. Kylee designed the “hers” master suite walk in closet at the Ford Custom Classic Homes executive home, which is a beautiful French Country inspired design. The master suite won for best overall master suite for the entire Parade of Homes. It is truly stunning! The interior designer for this home is Autumnflora Miklich with Bella Vita Interiors. I love the elegant exterior of this Ford Custom Classic Home, one of six open for touring as part of the 2017 Nashville Parade of Homes. 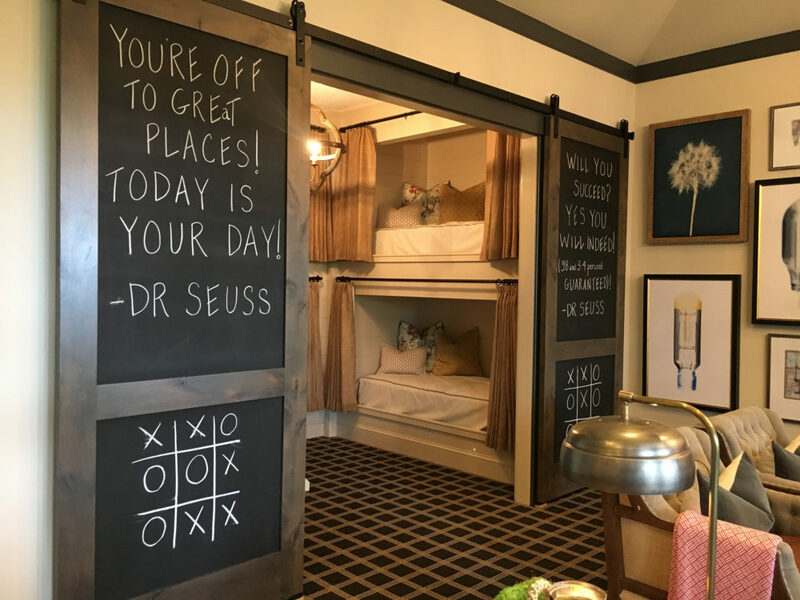 How fun is this upstairs bunk room? I love the sliding rustic doors with the chalkboard paint. 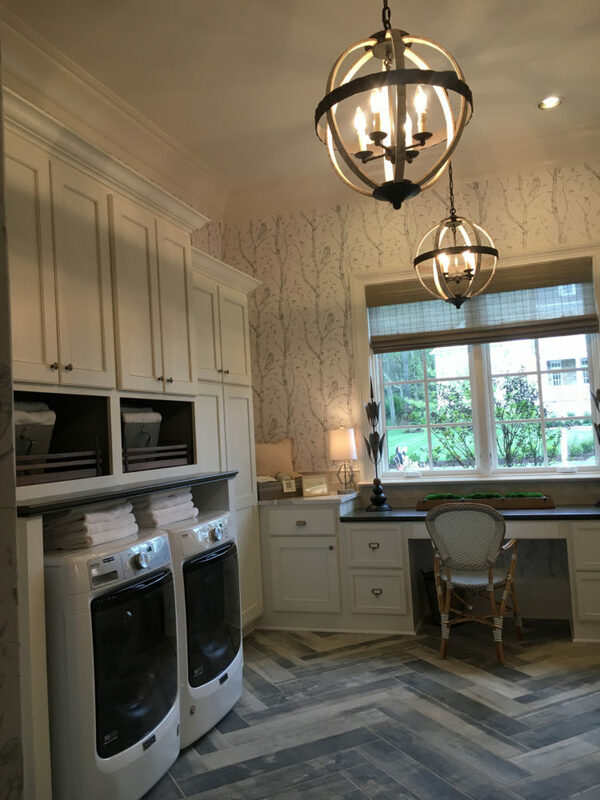 I could do laundry all day long in this laundry room! I loved the flooring. The California Closets custom closet is really a work of art and a glamorous design that is also very practical with lots of storage. The design features California Closets’ top of the line Tesoro® Tuscan Moon finish and Silver Gloss Shaker Style Drawers with glass and metal handles and knobs. The cabinets feature slanted shoe shelves with glass shelving. Mirror doors around the top highlight the tall ceilings and bounce lighting from the chandeliers which adds to the glamour. As part of her beautiful design, Kylee included strip lighting above every hanging pole to illuminate clothing, puck lights above glass shelves and strip lighting on the sides of the shoe shelving. Yes, this is a closet! Stunning showcase work by California Closets of Nashville, locally owned by Kurt and Adrienne Schusterman of Brentwood. Another great shot of this gorgeous walk in master suite closet. I love this seating area. Oh, and check out that clawfoot tub in the background! How many bloggers can you fit in this gorgeous glam closet? Six! A lucky winner will be drawn from all eligible entries left by midnight Sunday, October 15. 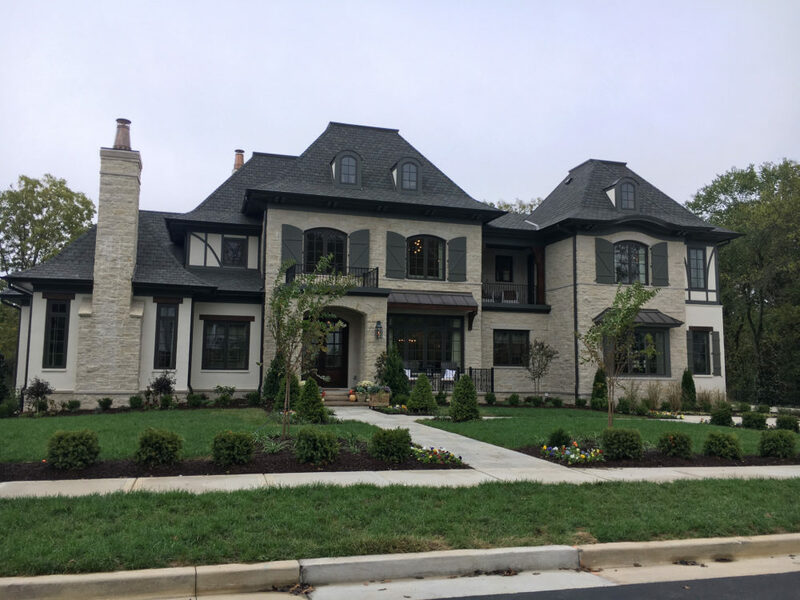 This entry was posted in Nashville, Reviews & Giveaways and tagged brentwood, California Closets of Nashville, giveaways, interior design, Nashville, Nashville Parade of Homes, Parade of Homes, Tennessee. I’d love a new California Closet redo of my mudroom with storage and space for the kids sports gear, outside toys, winter coats and laundry supplies. My dream closet would be the one above in the post above. Space for everything in a beautiful setting, and of course, a chandelier!